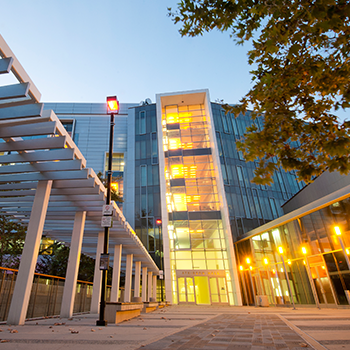 The 250,000sf Atkinson Hall was named in honor of former UCSD Chancellor and University of California President Richard C. Atkinson (who maintains an office in the building). 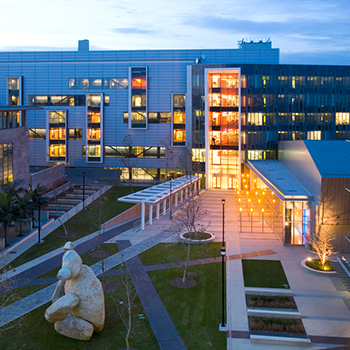 Atkinson Hall is the headquarters of the Qualcomm Institute, and the building was constructed as part of the State of California's investment in the two-campus California Institute for Telecommunications and Information Technology (Calit2) at UC San Diego and UC Irvine. See below for key public spaces available for use by internal UCSD and external groups, subject to fees, availability and approval. The Auditorium seats over 200 guests and is equipped with super-high-resolution cinema-quality projection and surround sound, as well as a built-in webcasting system and teleconferencing. The Theater is a reconfigurable space for meetings, performances and other uses, including the VROOM ultra-large-scale wall display system; maximum capacity is 90 guests. Roughly a dozen conference rooms with seating from 6 to as many as 45 guests are available to internal users (and external guests pending formal authorization); most rooms have large flat-screen display systems. 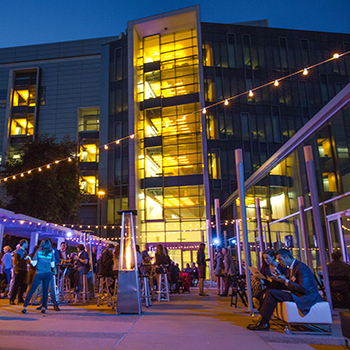 The Engineering Courtyard is an outdoor event space, particularly for larger events. The Lobby / Pre-Function Area outside the Auditorium and Theater offer venues to receptions and other events in connection with conferences and seminars held in the public spaces.